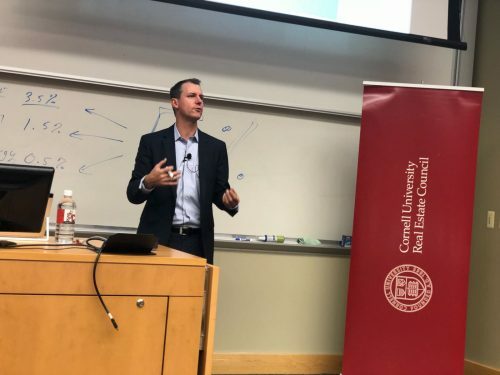 Cornell’s Baker Program in Real Estate was pleased to welcome Douglas Gottschalk, the U.S. head of corporate real estate at EY, to our Distinguished Speaker Series on March 22. Mr. Gottschalk shared his unique perspective on real estate consulting for corporate clients and all in attendance were treated to a lively discussion, full of both insight and entertainment. EY has over 16,000 real estate professionals world-wide, and Doug heads the 200+ member Transaction Advisory Services (TAS) team responsible for real estate consulting during M&As and divestitures in the U.S. In this capacity, TAS works on roughly 9 out of 10 of the largest M&As among fortune 1000 companies. 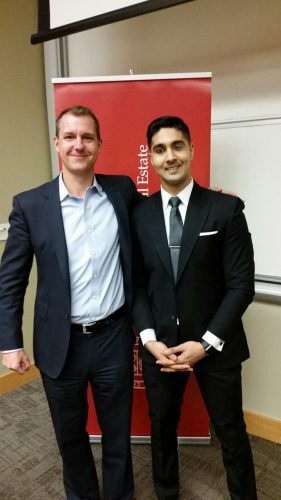 Doug shared with students that M&As are often the best time for a company to examine their real estate, but without help, these companies often do not know where to begin. Mr. Gottschalk’s remarks were entitled “The Burden of Corporate Real Estate”, and he began by distinguishing between Commercial Real Estate and Corporate Real Estate. By his definition, commercial real estate is when a company engages in real estate activities as part of their core business. Corporate real estate, on the other hand, involves the real estate activities of companies that aren’t focused on real estate as a part of their core business. Doug revealed to students that often these companies pay little or no attention to their real estate holdings. Like the famous quote by Rodney Dangerfield, in the corporate world, real estate “don’t get no respect!” Part of Doug’s job is simply to make companies aware of what real estate they possess. Once they know this, they are better able to make decisions about how to manage what they have. While this may sound like a simple task, it isn’t always as easy as one might think. One fascinating story that was shared with the group involved Doug investigating a property while performing a routine audit of a company’s real estate holdings. A chance comment over the telephone hinted to the fact that this company might possibly own an additional large property that they were not aware of. After two days, it was discovered that, unbeknownst to the company, they did in fact own this large property which they were able to quickly sell for $20 million. Often, the first step in properly managing a large corporate real estate portfolio is simply to find out what is out there. Mr. Gottschalk also shared with students his viewpoint that the key to understanding real estate is understanding people. For this reason, he came to Cornell to study Human Resources and Organizational Development, in addition to the Bachelors and Masters degrees in Architecture and the MBA he had previously earned from the University of Illinois. 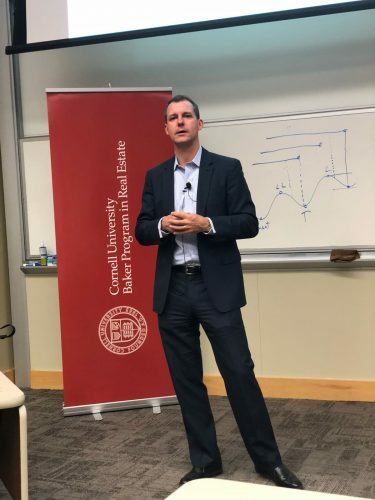 Companies spend far more on people than on real estate, Doug told students, and a proper understanding of real estate can enable companies to make decisions that use real estate as an enabler of employee interaction and employee wellness. This is particularly true during an M&A or divestiture. Learning from Mr. Gottshalk’s experiences in corporate real estate consulting was a sincere treat for Baker Program students. We would like to thank Doug for coming to campus and for sharing his insights and experiences with us as our honored guest of the Distinguished Speaker Series.